Jeanette, age 79, passed away peacefully surrounded by family on July 3, 2018. Jeanette was born in Hilo, Hawaii to Abraham Kapuahelani Makaio and Phoebe Keoahu Stevens Makaio. In her teenage years Jeanette entertained with her mother's Hula troupe at the original Naniloa Hotel in Hilo, and at other island venues. 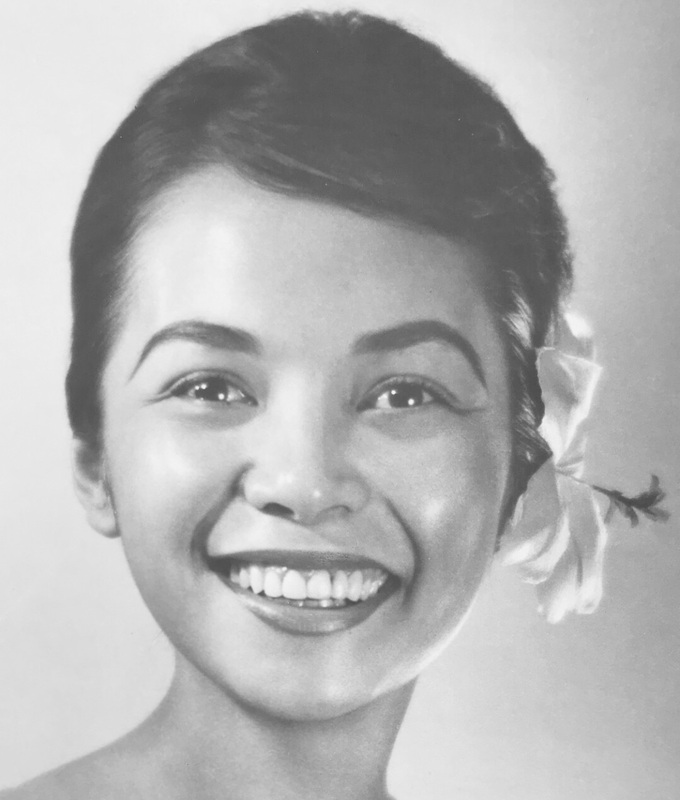 A Hilo High School graduate, she was crowned Miss Aloha Hawaii, representing the Big Island in the 1956 Miss Hawaii Pageant, and was named Miss Congeniality. Later that year, she was hired by Hawaiian Airlines as a flight attendant at age 17 the youngest ever hired at the time. During her tenure with Hawaiian Airlines she travelled throughout Asia and the mainland, promoting the islands and Hawaiian Air. (The photo above was taken during this period of Jeanette's life.) In 1959 she married John A. "Jack" Hoag, a Captain in the United States Marine Corps. Jack would often describe Jeanette as the most beautiful woman that he ever saw, both spiritually and physically. When seeking her attention before they were married, he would fly his helicopter down the Ala Wai, buzzing her little cottage on Olohana Street, much to her consternation. Jeanette's professional career and life was dramatically altered in 1964 when a drunken driver crashed head on into her and Jack's car, causing critical injuries to her entire body. In the ensuing days even though she nearly died twice, she survived with her strong will and faith. The rest of her life she overcame pain, despite dozens of major surgeries and hospital stays. Throughout it all she never despaired, always expressing and exhibiting her unwavering faith in her Savior, Jesus Christ, and His love for her. She devoted her energies and love to her husband, her three beautiful children, and many grandchildren. Jeanette was a stalwart member of The Church of Jesus Christ of Latter-day Saints (Mormon). Her lifetime of church service included various teaching and leadership positions, and as a supervisor in the Laie Hawaii Temple. She loved God's word and was adept at quoting the Bible, the Book of Mormon, and other scripture. Although her physical limitations made it difficult for her to dance hula, Jeanette cultivated her vocal talents and her angelic voice blessed large congregations, as well as more intimate family gatherings. Jeanette also provided community service for Meals-On-Wheels, and for Kapiolani Hospital with her two daughters. Jeanette is survived by her sister, Vanda Leilani Tuia (Malcolm), and her brother James "Kimo" Makaio (her older sister, Elaine Poipe Makaio, passed away in 1992). Jeanette is also survived by her loving husband of 58 years, John "Jack" Arthur Hoag; her three children, John Stevens Keali'iwahamana Hoag (Heather), Vanessa Keahiuilani, Shannon Liana Kananimauloa Horito (Michael); fourteen grandchildren, Jessica Ka'imiokalani Litzenberger (Stefan), Christin Kealohiokalani Hoag, Alexandra Kamalamalamaokalani Hoag, Daniel Keali'iwahamana Hoag, Vaiola Lehuauilani, Teineiti Keahiuilani Harrington, Durrant Makaio Harrington, Aidan Moroni Harrington, Christian Ka'imiikapono Horito, Michaela Kapuahelani Horito, McIntyre Kaleookeku'oko'a Horito, Alexis Kananiloaokamana'olana Horito, Nicholas Kupa'anaueue'ole Horito, Lincoln 'Umialiloa Horito; and a great grandson, Sawyer Makanaokeakua Litzenberger. Jeanette's return to her heavenly home and parents was a tender, spiritual experience at Castle Hospital, surrounded by her husband, three children, daughter-in-law, and five of her beloved grandchildren singing favorite church hymns, and sharing sweet memories of Jeanette. The family extends its appreciation to Adventist Health Castle President, Kathryn Raethel, the physicians, and entire staff at Castle Hospital; and also to the bishopric and membership of her local congregation, Kahala Ward LDS. Services will be held on Tuesday, July 17, 2018 at the Kahala Chapel of The Church of Jesus Christ of Latter-day Saints, 4847 Kilauea Avenue, Honolulu, Hawaii. There will be a closed casket viewing at 9:30 a.m., with funeral service to follow at 11:00 a.m., and light lunch afterwards. Private burial services to be held later that afternoon. Arrangements made my Borthwick Mortuary. The Family requests that any donations be made to BYU-Hawaii, LDS Philanthropies, 1450 North University Ave. Provo, Utah 84602.